Roman history tells us that iron wedding rings were a public symbol of the pledge between a man and woman to honor their marriage. Christians adopted this practice and made it a part of their traditions and gold became the popular choice for wedding rings during the second century AD. During Medieval times stones were added to wedding rings. Solitaire - Refers to a diamond engagement ring with one diamond or other gemstone. It will often be extended to mean a piece of jewelry with one important diamond or gemstone in the center and accent stones on each side. Solitaires are made by two distinct manufacturing processes. Rings with Side Stones - Most of the popular diamond cuts are used as side stones on bridal rings. Included in this group are baguettes, tapered baguette, round, trillion and oval. These are used to enhance the center stone and not detract from it. Cathedral Mounting - Ring setting that arches when seen from the side. Cathedral rings have projections on each side of the stone and these design elements are what gives this ring its name. They are inspired by the arches that supported the walls of early cathedrals. Just as these arches were a distinctive and important design element in architecture, the graceful projections on our cathedral rings add support and protection to the setting. They also give the diamond engagement ring its classic and unique look. Bypass - A diamond engagement ring design in which the two sides of the ring do not meet in a straight line, but "bypass" one another. 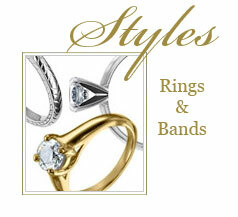 Three Stone - Three stone rings are popular for engagement rings, wedding diamond rings and anniversaries. A general rule is that the side diamonds must be at least 25% as large as the center. Die Struck Method - The shank is formed by a process called "cold forging". This process has been used throughout history in the making of coins and medals as well as jewelry. The process is simply described as forming a ring by using extreme force to drive the precious material into a shaped cavity in a steel block. The metal will then take the shape of the cavity and can be rounded and finished. The setting is then assembled to the shank. Cast Method - Cast solitaires are made using the "lost wax casting method". This is an ancient process where a mold is formed around a wax ring. The mold is made from a plaster-like compound called investment. The mold is placed upside down in a kiln and the wax is slowly melted and burned out. The space where the wax was, becomes a cavity in the mold that has the shape of the ring. Molten metal is then poured into the mold filling the cavity. When it cools and solidifies, the investment is broken away, leaving a gold or platinum ring. The ring is then hand polished and the stone set. Modern technology has updated this ancient process and has made it both efficient and reliable. One advantage of the lost wax method is that there are very few limits placed upon design. While cold forging is quick and produces a better quality product, there can be no undercuts in the design. However, this casting process allows most design elements to be made easily. Cast and die struck components can be assembled together giving the best features of both methods. Florentine - A type of metal finish, similar to a satin finish but with a deeper etching in the gold. Polished - Most popular finish on gold, giving it a smooth finish and a bright shine. Satin - A widely used finish on gold, achieved by dulling the surface to create a silk like luster instead of a shiny surface. Danforth Diamond recommends choosing wedding diamond rings based on appearance and comfort. There are a number of wedding diamond ring styles to choose from, ranging from the comfortable and classic Half Round style to the more complex Filigree style with lacy, pattern designs. Widths of wedding diamond rings are measured in millimeters. Traditional bride wedding rings range from 2 to 8 millimeters, while groom wedding rings can range from 4 to 12 millimeters. Take note that wider width flat rings may not be as comfortable to wear, so you may want to go with a comfort-fit when buying a wide-width style. Channel Ring - These wedding rings have diamonds that are set either part way or all the way around the ring. Tapered Ring - These tapered diamond rings are wider at the top than at the bottom. Milgrain Ring - A wedding ring of metal that is decorated with tiny beads of metal along the edges of the ring. The center section can be half round or flat. EZ-Fit or Comfort Fit - The inside shank of a wedding ring that is slightly rounded (convex) to provide a more comfortable fit. Filigree - Gold or silver wire twisted and soldered into complex patterns; fancy, lacy-looking designs. Bridal Set - A set of two wedding diamond rings that fit together - the diamond engagement ring and the wedding ring. Trio Set - Set of three wedding rings, including the engagement ring and matching wedding ring for her, and matching wedding band for him. Anniversary diamond rings are usually made of gold or platinum and are set with stones across the ring. They are most often given by a husband to his wife as a token of continued love, to mark an event such as an anniversary. Classic Anniversary Ring - a simple single row, straight-line ring with channel-set diamonds or other gemstones. Need more information about engagement rings styles? Learn more about setting styles.